A couple of weeks ago I did a review of the CTP4 of SP1 that came out for SQL Server 2012 – Installing SQL Server 2012 SP1 CT4 Experience. Part of my test involved upgrading an Excel 2013 PowerPivot file to a Tabular Analysis Service project. After I did that I setup a BI Semantic Model connection file in SharePoint and explored the Power View designer updates. It was business as usual and I was seeing all of the new features and functionality that I had previously mention in my posts on Excel 2013 and Power View – Power View meet Microsoft Excel 2013 and Power View meet Microsoft Excel 2013 Part 2. I completed out the pre-con still confused and then last weekend I did a bit more digging into this issue. 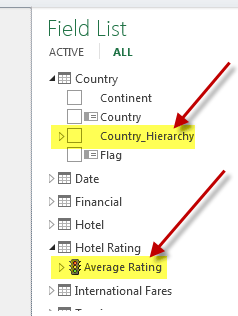 I went back to my Excel 2013 SQLSaturday model that I upgraded and I reviewed the property settings on the database. The item that I noticed that seemed like it might be important was the Compatibility Level setting. 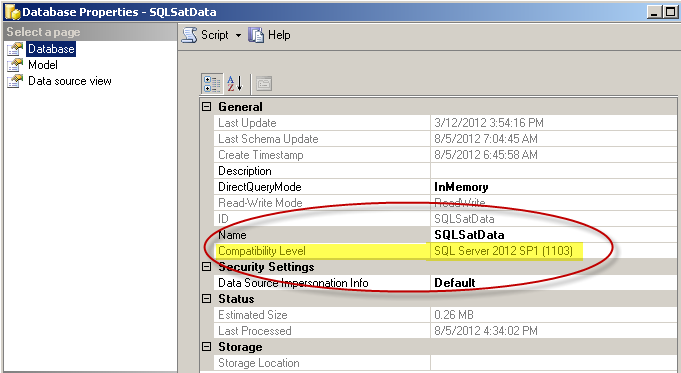 This database was showing SQL Server 2012 SP1 (1103). I then took a look at the database I was using for some of my demos. Ahhh, now the light bulb was starting to get bright:) The database that I was deploying was still in the SQL Server 2012 (1100) setting even though I had upgraded my environment to SP1. Interesting. Apparently you have the ability to control this setting now if you want to run in different levels or do some testing in the same environment before upgrading all of your databases. I didn’t realize that I now had to make a change on my model property settings before I deployed my database. 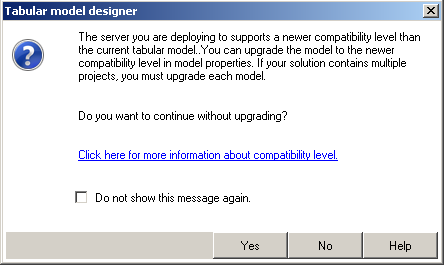 Once again I click ‘Yes’ and redeploy to upgrade the database on the server. Now when I connect to my model with Power View I see my hierarchies and KPIs, perfect!